From the minute you walk into the nondescript warehouse building in Olneyville that is home to Providence Specialty Foods and its award-winning Narragansett Creamery division, you know you're in a place that takes pride in its product. On the walls of the reception area, framed menus from the best restaurants feature dishes made with these cheeses. And in the conference room, owners Mark and Pattie Federico display photos of their grandparents, and the grocery business in New Haven, Connecticut, where their story began two generations ago. In 2007, the Federicos' established cheese business partnered with Louella Hill, founder of Narrangansett Creamery, to take her small batch cheeses to a broader market while maintaining the standards and values of an artisanal product. Their product line now includes mozzarella, ricotta, feta, queso blanco, cheese spreads and yogurts, all made with fresh milk from family farms, vegetarian-friendly (no animal rennet, ever) and kosher-certified. In the shipping room, we found an assortment of a few of Narragansett Creamery's cheese spreads and yogurts awaiting departure. If you live in Rhode Island, look for these products at supermarkets and farmers' markets around the state. If you're visiting, be sure to treat yourself to a taste of Narragansett Creamery cheeses and yogurts while you're here. 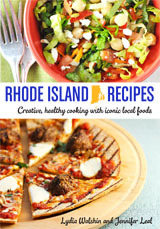 PS: There are eight recipes in Rhode Island Recipes that use Narragansett Creamery cheese! Of course, if you're elsewhere, you can substitute your local favorite cheeses in any of our recipes. Wonderful! We also have similar food and drink producers in our local area. Often family run and the attention to detail and quality is second to none. Best of luck with your superb business!